The Caps topped off their latest 5 game road trip with a hard-fought 1-0 victory in Pittsburgh. The game capped off a wild cross-country journey that saw the Caps bring in 6 points out of a possible 10. And for many, it also brought about a rebirth of sorts of Alex Ovechkin. He got the lone tally with a 45 foot blast during a second period power play that proved to be all the Caps needed to hold off a struggling and injured Penguins team. The goal was Ovechkin’s third in the last four games; he’s got 6 points total over the same stretch, and has 9 goals (17 points) over his last 15. Slump? Over. The Caps’ win also marked an odd trivia point for the team that won’t likely be repeated by anyone in the NHL any time soon. In the Caps’ last three visits to Pittsburgh, they’ve beat the Pens in three different venues: the Civic (Mellon) Arena with a 6-3 win on April 6; the 3-1 Winter Class victory at Heinz Field on January 1; and last night’s shutout in the new Consol Energy Center. The game was also Michal Neuvirth’s second shutout in 15 days, both against the Penguins. After a wild 7-6 victory in Anaheim and the reappearance of Alexander Semin to the goal category on Wednesday, it looked as if the spark had returned to the Washington Capitals. 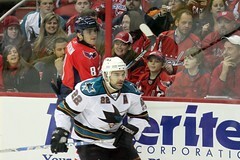 The Caps moved on in their West Coast tour with a stop last night in San Jose to face the struggling Sharks. Last year at this time, DC was buried under Snowmaggedon. The Caps lit the region with a hard-fought win over the Penguins as everyone prepped for the Super Bowl. This year, it’s deja-vu…sorta. The Caps came into this afternoon’s contest on a mission to establish themselves and their game plan. After their dominating win over Tampa on Friday, it was imperative the Caps continue their new-found momentum as the Pittsburgh Penguins visited the Verizon Center. One would think that Ovechkin’s hat trick against Toronto the other night was the spark that would re-ignite the Capitals offense. Last night’s game against the Thrashers was eagerly anticipated by many with expectations of seeing the old Caps offense of the early season just explode right before the weekend All Star break. Alas, no. The Caps lost to a streaky Atlanta team 1-0, with Thrashers goalie Ondrej Pavelec shutting the Caps down once again. Quite a difference for the Atlanta netminder, who started the season by fainting to the ice in the first period against the Caps. With the win, the Thrashers take the season series with a 4-1-1 record against the Capitals. It’s not without effort on the Caps part, however. They have been trying like crazy to make something work; witness the onslaught against hapless Toronto. But the offense just isn’t clicking in the right way and goals aren’t coming in the bunches everyone is used to seeing over the last three years. The Caps threw 36 shots on Pavelec last night; Ovechkin accounted for 8 and Brooks Laich for 7. The Caps have scored more than three goals only once in the last 15 games. At the beginning of the season, many fans of the Caps pretty much wanted to fast-forward to mid-April and get going with the playoffs. Going into this year’s campaign, the Caps looked pretty good on paper and were predicted to be yet again runaway winners of the Southeast Division and one of the top three seeds in the Eastern Conference. Now? Well, it’s not all doom and gloom – but reality has definitely sunk in. The Caps currently sit second in the Southeast Division, one point behind the current leader, Tampa Bay. And two points behind the Caps? The surprisingly strong Atlanta Thrashers. This year’s division race will not be a repeat of last year, when the Caps had sealed their division title before the Ides of March with a thirty point cushion. It will come down to the wire again, much like 2007-08, when the Caps wrested the title from the Carolina Hurricanes on the last game of the season. When comparing the first half of this season to the last two, the Caps are virtually in the same spot. Currently sitting with 52 points this year, it’s only three points less than last season and five points less than two years back. True, it is “less than,” which annoys many fans to no end. But considering the adversity and issues the team has had to deal with so far, the fact that they’re not less than 10 or 15 points back is something to take a bit of pride in. Or is it? 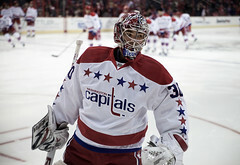 The Washington Capitals lost to Dallas last night, the victims of a Texan robbery. With only 7 seconds to go, defenseman John Carlson’s shot looked like it would sent the game into overtime just as Stars defenseman Karlis Skrastins and Caps winger Alex Ovechkin got tangled up and plowed into Stars goalie Andrew Raycroft. 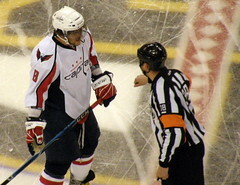 The referee blew the whistle and waved off the goal, saying that Ovechkin had interfered with Raycroft. The Washington Capitals went into last night’s game against the Buffalo Sabres with a chip the size of the second period on their shoulder. For the last few contests, the Caps have suffered a relapse of play midway through their games and some media has taken the team to task for it. After all, their second period stutters have allowed their opponents to come back into the game. History almost repeated itself last night. Fresh off their shellacking of New Jersey on Saturday, the Caps were looking to extend their success last night against Ottawa. The Senators were looking for some redemption after being pasted by Toronto and in search of their first point on the season. A point they got, but the Senators left the Verizon Center winless, thanks to the overtime heroics of one Alex Ovechkin. With a great fake, Ovechkin slammed a low shot home past Pascal Leclaire with only 31 seconds remaining in overtime, giving the Caps their second win in a row and on the season. The goal capped a high intensity game that by rights, Ottawa could’ve won. The Caps opened up their 2010-11 campaign last night in Atlanta. With high expectations for the team by many, the Caps were looking to jump out of the gate to redeem themselves from last season’s playoff collapse. With only six shots in the first period, it wasn’t exactly a well-oiled Caps machine that hit the ice. Showing signs of struggle all through the evening, especially in their own zone, the Caps ultimately skated to a 4-2 loss to the new and improved Thrashers. 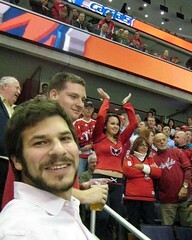 Tomorrow is the start of the 2010-11 NHL regular season, pretty much the only sport that matters in my household. Around the DC area, the Washington Capitals are becoming – if not already – the number two sports franchise, and with good reason: unlike many of the other pro teams in the area, the Caps have been consistent winners the last several years. Today’s date, actually, should probably be declared a local holiday. Why? Well, five years ago on October 5, some rookie with the number 8 on his sweater hit the Verizon Center ice in the season opener against the Columbus Blue Jackets. Forty seconds into the game, Alexander Ovechkin – the rookie in question – hit defenseman Radoslav Suchy so hard against the glass that one of the supports broke loose and hit the ice. A portent of things to come? If so, Ovechkin had two more signs to stamp his arrival to the NHL that night – his first two goals of his career, one of them a great one-timer from Jeff Halpern. At the end of that game, there was no doubt: Ovechkin – and the Capitals – had arrived at the next level. It’s been an Ovechkin-fueled rocket ship ride for the Capitals since, with no sign of stopping. After what seemed like weeks of waiting – ever since the Olympics were over, really – the Washington Capitals finally enter the NHL postseason. First opponent in the opening salvos of the Eastern Conference Quarterfinals? The Caps desperately want to get the right skate forward this year; after last year’s rough start dropping the first two games at home against the Rangers, it’s something the team is aching to move past. And by all accounts from various team sources the last couple of days, they’re not only aware of it, they’re chomping at the bit to roll. Despite the Habs’ recent struggles, however, the Caps cannot enter the series tomorrow taking Montreal for granted. True, the Habs enter the postseason after only notching three wins in their final 11 games. And true, forward Michael Cammalleri hasn’t been nearly as effective in his first nine games after knee surgery, nor has the netminder situation been anything spectacular. No team enters the NHL’s “second season” not wanting the prize at the end of the two-month campaign. Let’s not kid around – both of these teams want the Stanley Cup. Montreal, to start its next century off right after last year’s dismal failure to celebrate their 100 years in style. Washington, to finally grab the golden ring of hockey that has been oh-so-close only a handful of times in its young (relative to Montreal) hockey existence. So let’s look over the keys to Round One, starting here in the District on Thursday at 7 p.m. 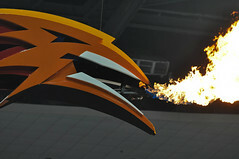 So did you see the big game on NBC yesterday? Yesterday’s big game wasn’t played in Miami, aired on CBS, filled with cheesy, stupid commercials. It was right here in DC, in the heart of snowmageddon. 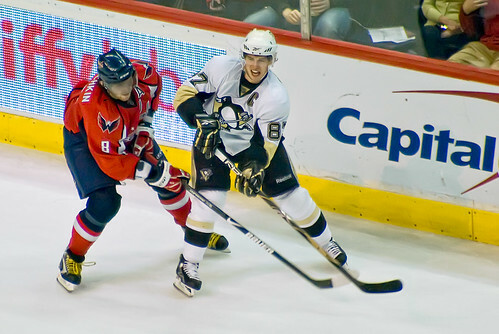 It was the Pittsburgh Penguins against the Washington Capitals. And yesterday, that game lived up to every fan’s dream, regardless which side of center ice they were on. Settling into one’s seat last night at the Verizon Center, one would wonder what roller coaster the Washington Capitals had planned next? Visiting the seven-game-streaking Caps were the Anaheim Ducks on a six game road trip. The Caps, fresh off a 7-2 blowout of the New York Islanders on Tuesday where seemingly everyone grabbed a point except captain Alex Ovechkin, were looking to lengthen their 19 point lead in the Southeast Conference and remain atop the East as the NHL drove towards the Olympic break. Ovie had to have felt left out of the fun on Long Island and let it show early by burying the puck only 36 seconds into the game. A solid twelve minute run through the first period saw the Caps dominating in the Duck’s zone, racking up a 13-3 shots on goal advantage before Anaheim’s offense settled down. The Caps ended the period with a season-high matching 19 shots on goal, peppering Jean-Sebastien Giguere in spurts during his first game back in over two weeks. The game settled down in the second; both Giguere and Michal Neuvirth had some terrific saves as both teams hammered into the zones. Dan Sexton managed to finally get one past Neuvirth and it looked as if the game would settle into a classic low-scoring goalie duel. But everything flipped in the span of less than three minutes as the third period unfolded. Thank goodness, it’s almost Hockeytime. No, seriously. I get the Redskins, people. Really. But I’m not a football fan. It’s all about sticks, pucks and skates – and the cool Zamboni ‘race’ between periods.